The Boston Bruins came up with a rare shutout victory over the fading Toronto Maple Leafs last night at Maple Leaf Gardens. In the other scheduled National Hockey League game, Montreal doubled Detroit 4-2. The Bruins’ win at Toronto was spurred by the play of two Boston rookies. Goalie Jack Norris and defenceman Bob Woytowich were standouts all night. Norris made 35 saves in recording his first NHL shutout. He wasn’t severely tested by Toronto, as the Leafs seemed almost indifferent and clearly weren’t motivated going in to this game. Any strong chances at the Boston goal that did develop went by the way side because of an errant pass or a simple lack of effort. Woytowich showed poise and ability that belies his status as a rookie. He is particularly adept at clearing the front of the net of loose pucks, and he makes a very good first pass out of the zone. He rarely got flustered on those rare occasions when the Leafs tried to exert any pressure on the Boston defence. 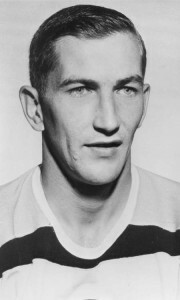 Boston rookie defenceman Bob Woytowich. Ab McDonald, once the object of Punch Imlach’s trade desires, and Tommy Williams scored the Boston goals. Goalkeeper Terry Sawchuk was the best the Leafs could offer, making 39 saves. He kept the score respectable and received no backing whatsoever from his mates. Allan Stanley missed the game with a groin injury. Dickie Moore was inserted into the lineup, forcing Imlach to go with only four defenceman for the game. The Montreal Canadiens snapped the Detroit Red Wings’ winning streak at seven games with their win at the Forum in Montreal. The game nearly wasn’t played, as it was delayed for 30 minutes in starting by a power failure in the area of the rink. Emergency lighting illuminated the Forum until power could be restored to a point where the game was able to commence. The delay seemed to discombobulate the Red Wings, as they looked confused and bewildered to start. Montreal roared out of the gate, oushooting the Wings 22-8 in the opening frame. 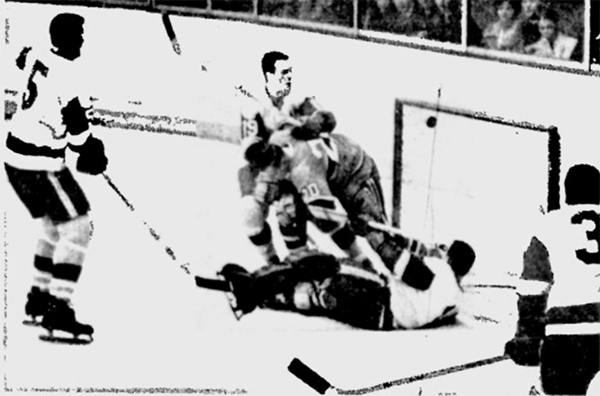 It was only the work of Detroit netminder Roger Crozier that kept the game from becoming a rout early. The period ended tied 2-2, a score that was extremely kind to the visitors. Jean Beliveau, Ralph Backstrom, Dave Balon and Claude Provost scored the Montreal goals. Doug Barkley and Parker MacDonald replied for the Wings. Balon’s goal was the game-winner and came on a controversial play midway through the second period. He charged into the Detroit goal crease and bowled over Crozier before deflecting a pass from Backstrom high into the net. Dave Balon scored the game-winner for Montreal. The win may be a costly one for Montreal. They lost Henri Richard with a bruised knee cap and Balon with a wrenched shoulder. John Ferguson was already missing with an undisclosed injury. After the game, the Canadiens recalled forward Red Berenson from Quebec of the American Hockey League as an emergency injury replacement. The Canadian national hockey team lost its second game in a row at the world championships yesterday, dropping a 6-4 decision to Sweden. A second period in which the Canadians allowed four goals proved to be their undoing. Nils Nilsson led the Swedish attack. 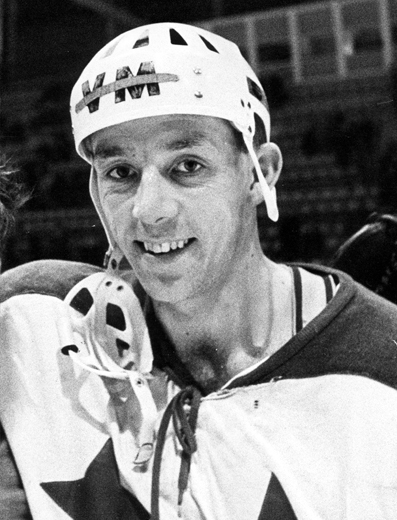 Canadian scorers were Gary Aldcorn, Jim McKenzie, Bob Forhan and Gary Dineen. Nils Nilsson scored twice for Sweden to pace their attack. Sweden outshot Canada 32-17. Don Collins replaced Ken Broderick in goal for Canada in this one.